This post is for all the Instagram users out there. Last week, your favorite photo and video sharing social networking service received some really exciting new features. Instagram updated its Android and iOS apps with fresh features for Instagram Direct, the new messaging feature of the social networking service. The month of August also saw Instagram incorporating some changes to its apps. The social networking service started allowing users to post images in bigger formats such as landscape and portrait orientations. Instagram Direct was originally launched in 2013 as a tool for privately sharing photos with small groups or any one person of the user’s choice. In the past two years, it has gained significant popularity among users. Recently obtained statistics suggest, each month sees around 85 million of the 300 million Instagram users using this private photo sharing service. 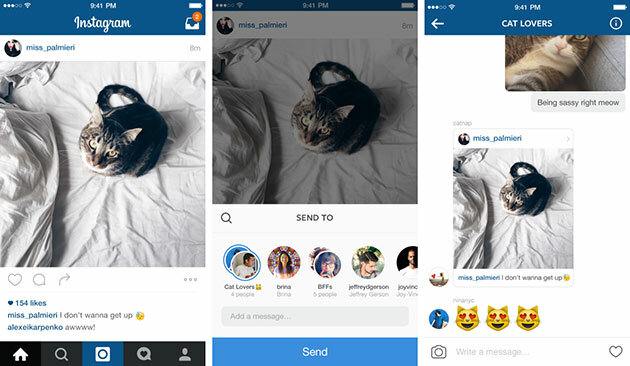 One of the most prominent new features added to Instagram Direct is the option of threaded messaging. By enabling threaded messages, Instagram has made the process of interaction much easier for its users. The feature will ensure that users don’t need to create fresh conversations every time they send videos and photos to people they want to stay connected with. What’s more, from now on you will be able to name each of your threaded conversations; this will make finding them even easier. The updated version of Instagram Direct also provides users with the ability to send content from their feeds as a Direct Message. There’s a quick camera feature, which on the other hand, will enable users to respond with a video or a photo seamlessly in Direct Messages. With this camera feature, users will be able to take perfect selfies more promptly than ever before. Emoji fans also had some treat in store for them. Instagram Direct now has jumbo emojis, which are much bigger than the ones accompanying the previous version. That’s not all; Instagram Direct now allows its users to add as many as 15 people to a conversation and pick name for their groups at will. Almost 40% of all Instagram comments are “mentions”. For those who are not familiar with the term “mentions”: it happens when an Instagram user shares a photo with his or her friend by tagging that person using @ (at the rate) symbol. This mostly happens when a user comes across a funny or inspiring photo. During last week’s update, the online photo and video sharing service added a new “arrow” icon below every post, beside the pre-existing “comment” and “like” icons. Users will now be able to send a post to a group or a particular friend as an Instagram Direct message just by tapping on the arrow icon under it. If you own a private Instagram account, your photos and videos will still just be visible to your approved followers. Posts send through Instagram Direct will remain visible only to users who can already see them.